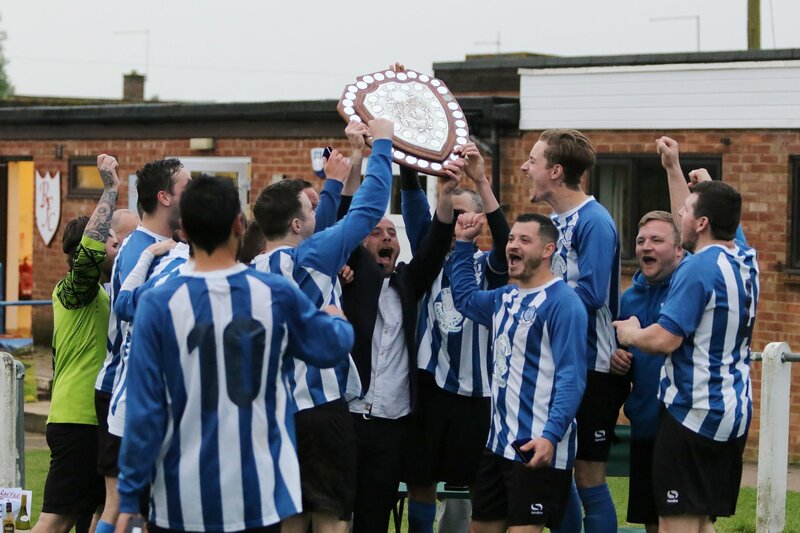 Buckingham United Firsts took on Steeple Claydon in another six pointer between two teams towards the top of the table. After an impressive win over Scot, Buckingham were looking to push on and secure third place. United started the better team and, managing to keep the ball on the ground against high winds and a poor surface they, moved the ball around and began to frustrate Steeple Claydon. The ball was worked through the midfield to the forwards Lewis Parkin and Mitchell Young both looking dangerous. Lewis picked up the ball on the edge of the box, with a few yards space, and whipped in a shot just missing the top corner. Although playing against the wind Buckingham were dominating the half. Lewis Parkin picked up the ball, turned and seeing the run of Jimmy Richardson, put a perfect through ball putting Jimmy Richardson in a one on one with the keeper before he calmly slotted it home in the bottom right corner. Claydon began to make their presence felt across the pitch and tackling well got themselves back into the match. A long ball cleared the defence and found the Claydon forward who volleyed in from close range. Steeple Claydon started to use the strong wind and pegged Buckingham back into their own half. A succession of corners led to one being whipped in and a Buckingham defender putting a clearance into the Buckingham net. The half-time whistle blew on the score at 2-1. Kicking with the wind in the second half Buckingham knew they could dominate large parts of the match. The Firsts started the second half well and several times Danny Charlesworth beat his man to start some promising moves that ended in tame efforts. Bobby Cooney grew in the match and the attention he received from the Steeple midfield resulted in two promising free kicks for Buckingham. The first was put over the bar and the second floated in with the wind, looked to be creeping in, but was finger-tipped over. Dean O'Connor made some substitutions for the second half that made an immediate impact. Kemzie Elenwo picked up the ball on the right wing and, for the second time in three matches, scored from 30 yards by lobbing the keeper and finding the top left corner. Back in the match with 18 minutes left Buckingham were pushing for more goals. Substitute Chris Thornton's influence grew, winning the ball back and the vision to put Buckingham on the front foot. A well worked move led to a corner, the cross didn't clear the first man but, the rebound was whipped in by Chris Thornton and John Westcott headed home from 3 yards. Buckingham were level and, playing a tiring Claydon team, they had 10 minutes to win the match. Buckingham dominated the next 10 minutes but didn't get the winner and a late effort from Lewis Parkin couldn't find the net.